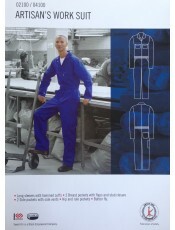 Artisan's work suit 04100 D59 300g SABS. Long sleeve with hemmed cuffs * 2 Breast pockets with flaps and stud closure * 2 Side pockets with side vents * Hip and rule pockets * Button fly. 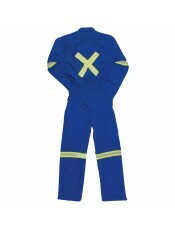 Boiler suit / jump suit.This is a durable overall in a one piece boiler suit style. This means it will cover your body from the neck down to your ankles and wrists. It comes in navy blue and royal blue colours this is a general purpose extra heavy duty warmer overall as it is made from the thicker 300gm..
Artisan's work suit 02100/213007 Green one piece flame retardant. 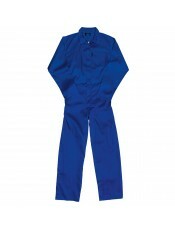 Long sleeve with hemmed cuffs * 2 Breast pockets with flaps and stud closure * 2 Side pockets with side vents * Hip and rule pockets * Button fly.Boiler suit / jump suit.This is a flame retardant overall in a one piece style. This means it will cover your body from the neck down to your ankles and wrists. Should it get hot enough or caught in a flame it will burn much slower than regular materials and it will resist quick heat ..
BOILER SUIT WHITEMADE TO SABS SPECLeft chest pocketBack right patch pocketConcealed riveted metal button frontElasticated backSide slitsSafety stitched seamsStress points bar-tackedPockets attached with double needleFABRIC: 80 / 20 Polycotton 3/1 TwillWEIGHT: 200 g/m²SIZES: 32 - 58COLOUR: White..
BOILER SUITS ROYAL BLUEMADE TO SABS SPECLeft chest pocket ∙ Back right patch pocket ∙ Concealed riveted metal button front ∙ Elasticated back ∙ Side slitsSafety stitched seams ∙ Stress points bar-tacked ∙ Pockets attached with double needleFABRIC: 80 / 20 Polycotton 3/1 TwillWEIGHT: 200 g/m²SIZES: 32 - 58COLOURS: Royal Blue..
D59 REFLECTIVE BOILER SUITMADE TO SABS SPEC50mm lime and silver reflective tape (EN 20471 Class II) around arms, legs, X on back and two strips across frontChest pockets with riveted metal button down flaps ∙ Concealed riveted metal button front ∙ Elasticated backSide slant swing pockets and slits ∙ Back right patch pocket and ruler pocket ∙ All seams triple needle stitchedStress points bar-tacked ∙ Pockets attached with double needleFABRIC: D59 ∙ 100% Cotton 4/1 SateenWEIGHT: 270 g/m²SIZES: 32 .. 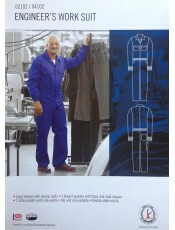 Engineer's work suite 04102/2107 Royal Blue / Navy Blue D59 300g one piece cotton with zip SABS Long sleeve with elastic cuffs * 2 Breast pockets with flaps and stud closure * 2 Side pockets with side vents * Hip and rule pockets * Double slider zip fly.Boiler suit / jump suit ..